The whole steed thing seems very Deverenian rather than NoThRoG. Also, he's a monster, and monsters aren't usually known for riding steeds. I guess it works. I know eating a steed isn't deverenian, but having an ability that involves steeds is. How many NoThRoG have printed abilities that involve steeds? Not many, if any. How many NoThRoG have Riding as a printed trait? Not many, if any. Now, how many Deverenians have abilities that involve steeds? How many have riding as a printed trait? Lots. The nothrog thing has been (at least for the level 4+ guys) kill/do something to your other characters to do even more damage to the opponent. Well, the thing is I had to find a way to keep him from playing and destroying insane amounts of steeds in a turn without making it 'once per turn'. As it is now, he can only do it twice a turn (one steed that readied at the start of the turn & playing another from your hand and using riding to ready it) without some form of item ready tech. But if you must have a flavor reason for his riding, I'll say back when he was still a merc he served a stint with the Dark Horsemen, but got booted for OBVIOUS reasons. If his ability said to kill one of your characters to make him beefy he'd play a lot differently. Right now he could run Nodwick and recycle the steeds he eats so he always has "food" to fuel his ability. He couldn't do that kind of thing with characters unless you played him in a Tourncoat deck, Gorm Skullcrusher the Elf. Also, if the cost was to kill one of your characters, I'd make the effect of that ability bigger. Maybe something like he gains an extra HP until end of turn if the character is lvl 3+. I think I just had a stroke of genius! Where the hell did everyone go?!?! With 4th edition Warlord fast approaching, I thought I'd try out some of the concepts it will be introducing. Behold! 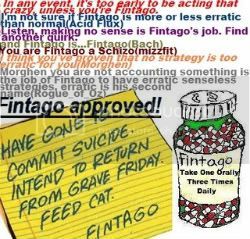 I think it should also have "where X is the level of the card discarded"
Don't try to out-crazy Fintago. You'll just die tired... and confused. 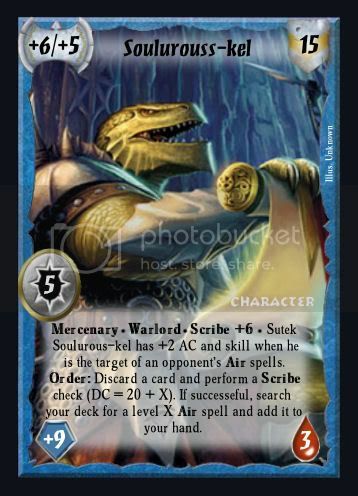 The sutek all seem like reptiles to me.I like water for this one instead of air. Ring isn't even a bold trait and characters can equip as many rings as they want. Might want to take that whole part out. Please do NOT post your cards on MY thread. It just not cool. I don't even care what the abilities are. You made a sutek warlord! Though I do agree that it should be water instead of air.